Home » Domains » Can IDN’s (Internationalised Domain Names) Effect my Email? Secondly – The Domain Name System (DNS) which performs a lookup service to translate user-friendly names into network addresses for locating Internet resources, such as websites and email addresses, is restricted in practice to the use of ASCII characters (see above). The internationalisation of domain names is a technical solution to translate names written in language-native scripts into an ASCII text representation that is compatible with the Domain Name System. Internationalised domain names can only be used with applications that are specifically designed for such use; they require no changes in the infrastructure of the Internet. IDN’s aren’t read in the same way as normal domain names and so the IDN’s are converted into ASCII characters using Punycode to make them readable for the Domain Name System (DNS) and applications. Thirdly – IDN’s won’t be displayed in web browsers as standard ASCII characters, but in Punycode. 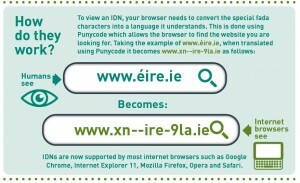 Most commom browsers can now handle Punycode, but this could be confusing to visitors if the notice. Fourthly – Some mail servers won’t be able to handle IDN’s and so if you’re looking to register your IDN that is one thing, but if you’re looking to use the IDN for email this could be something that your email / IT provider will need to investigate further. This entry was posted in Domains, Latest Information. Bookmark: permalink.